April 25th, 6:30 pm, at Duke's in Crystal Lake, IL. Drinks & Appetizers will be ready for you! This year has been tough for many families when it comes to colds, coughs and contagious sniffles that just never seem to go away. Allergies, asthma and ear infections are creeping in and taking over your family. Let's just get real for a minute and talk about the green gook, watery eyes, lingering cough and sore throats. These are miserable symptoms that put stress on everyone in the family. From missed school days to sleepless nights, your entire family is EXHAUSTED! You're tired of standing in the drugstore aisle deciding what to buy... 4-hour relief? 12-hour relief? What if you could find relief for MORE than 12 hours? What if the relief had no warning labels and could stop the cycle of getting one cold that leads to a sore throat that leads to a cough that never seems to go away? We've pulled together our best of the best CARE team to help you FINALLY get answers to why your child can't ever seem to KICK the SICK! We also can't wait for you to meet the most amazing Pediatric Nurse Practitioner, Jessica Pawlicki of Well-Rooted Pediatrics, newly opened in Crystal Lake! Together Dr. Tony, Dr. Matt & Jessica, APRN, FNP-C, will go deep into reasons for stress on the Nervous System, inflammation in the Gut, and suppression of the Immune System. Our focus will help you to decide on how to use more natural options to get the root of the problem, know when antibiotics and medical interventions may be needed, and when not! 1. 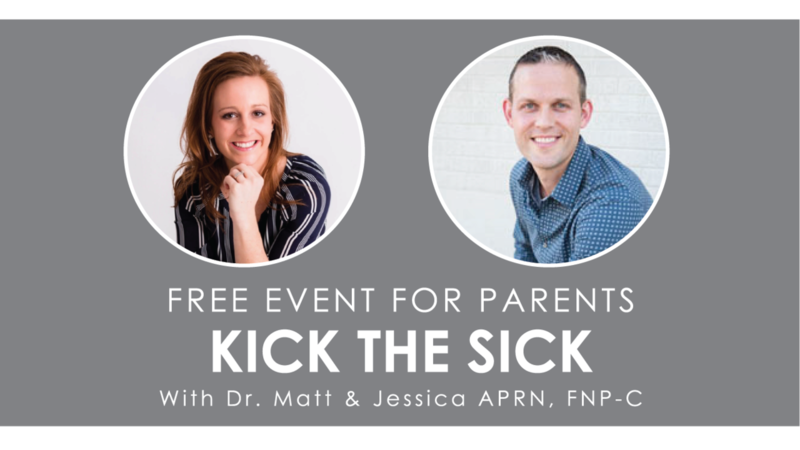 We will share the truth on why our families are stuck in the cycle of sick. From both the outside and the inside, we will help you put together the information you need to know why your family may be struggling to kick the sick! 2. We'll give you step by step help that you can use to start making a difference for your family. Together we help you learn how to MINIMIZE the tough days and MAXIMIZE the good days for your family. 3. The proof is in the parents...who have been where you are. We'll share with you stories of parents who no longer struggle with the symptoms of sleepless nights from coughs, colds & allergies. It’s time to make ear infections and late night runs to the drugstore a thing of the past! We can't wait to help you and your family! - Parents who are worried about their family’s immune system and are always feeling less than their best. Even the thought of standing next to someone who is coughing makes you cringe because you KNOW your child with “catch it”. - Parents who have children who are struggling with being sick so often that it is impacting the entire family. - Parents who are feeling burnt out and have tried everything to help their family feel better. Bonus - When you attend, you will receive an action plan for your family! We can't wait to help your family find the answers you've been looking for!